(Front L - R) S/Sgt Woodley O. Butler (TG)(3), Sgt Henry Geyer (WG)(7). 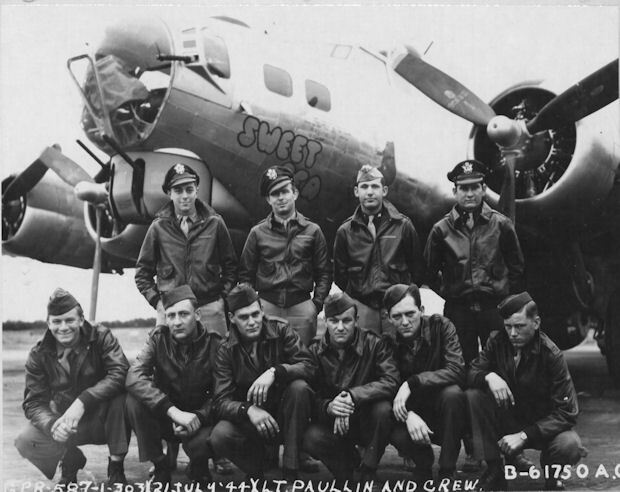 1Lt Robert A. Simmons (B) - Flew on nineteen missions (211 through 238) with the Lt Paullin Crew. Substitute Bombardiers were used on fourteen missions (243 through 267). Flew with other Pilots on fifteen missions (245, 246, 247, 248, 252, 263, 265, 267, 270, 271, 272, 274, 275, 276, 277). On mission 248, 28 Sept 1944 to Magdeburg, Germany, in B-17G #43-38176 Bouncing Betty II (358BS) VK-B, 1Lt Walter J. Mayer, Pilot, [MACR 10586] -- The B-17 was attacked by German fighters badly damaging the B-17. Crew Bailed out over friendly territory near Witz, Luxembourg. Three crewmen were injured and hospitalized. One crewman was KIA and the others returned to Molesworth. See 1Lt Walter J. Mayer photo page for further details. T/Sgt Henry R. Thomas (R) - Did not fly with the Lt Paullin crew on mission 246. Substitute Radio Operator used. Flew on mission #273 with another Pilot. S/Sgt Thomas J. Woodward (WG) - Did not fly with his crew on missions 251, 254, 255. Flew on missions 271, 273, 275, 277, 278 with the 1Lt Walter J. Mayer Crew. Sgt Henry Geyer (WG) - Deleted from the Lt Paullin crew when the 2nd Waist Gunner was eliminated from all combat crews. Flew no missions with the Lt Paullin Crew. Flew on mission #364, 25 April 1945 as Tail Gunner with the 1Lt Jerome Milman crew.